Keeping worship music fresh isn't an easy feat these days. Shane & Shane have successfully put a new face on worship with their last three records, tours dotted with sold-out shows, and now a new record, Clean. Rather than following trends or repeating what's already been done, the Shanes have kicked their impassioned blend of acoustic rock and pop-laced-worship up a level with their new release, recorded entirely in the duo's new studio in Duncanville, TX. Clean is the latest in a string of 'surprise' hit records from long-time indie faves-turned-hot-selling Christian music stalwarts, whose two most recent projects, 2003's Carry Away and this year's fan project, Upstairs, were met with Top 10 sales debuts. The duo, known for their dueling acoustic guitars and searing harmonies, tasted radio success last year with the impassioned "Be Near" and "Mercy Reigns," previews Clean with an amped-up cover of Twila Paris' classic worship anthem, "He Is Exalted." "We sort of struggled with the title," says Shane Barnard, "but we ended up with a majority of the songs that had to do with grace." Those songs describe "the fight of not feeling clean, the fight of what we feel like we look like to God, versus the truth of how He really sees us," he says. That theme works out over several of the songs, chief among them the standout "You And I." "'You and I' is really just about that struggle and about what we have to offer God," says Barnard. "It's a battle. The bridge on that is one of my favorite parts of the CD. It's just God saying 'you're clean, you're clean,' and man coming in and saying 'I'm not.' The song goes back and forth, but it ends with God saying 'that's what I'm wanting-a broken and contrite spirit.'" He stresses that we have nothing to offer God. "It seems like we have such a mindset of trading when it comes to our understanding of God-if you do something good, you receive something good. If you do something bad, you receive something bad. Unfortunately that's how a lot of people relate to God. It's really hard to understand that our currency of 'doing good' is really worthless to God, and that His grace is truly given for free." The duo chose to give a facelift to Twila Paris' "He Is Exalted," a song which proves a fresh take on a now-classic song. Barnard says that's a song "I've played every single week of my Christian existence. Over like 14 years? That's a lot of weeks ..." The pair has often closed its concerts with the song, which they say reaches across generational lines. "It's a very uniting song," says Barnard. Another high point on the record is the powerful, propulsive "Fringes," inspired by Job 26. The first part of the chapter "talks about a big God, His creation, how 'He stretches out the north over empty space and hangs the earth on nothing.' That's the first line of the song. Thoughts like that fill that chapter in Job, and then at the very end, it says 'but these are but the fringes of his ways.'" "The point is that everything-everything-we see, here on the earth is just a fringe on the garment of God, a tiny peek at who He is," he says. "I consider that everything, not just the normal things we think of--trees, creation, etc., but everything that has been created whether it's a laptop, a guitar amplifier, you name it. Everything is a reflection of God's amazing creativity." Shane Everett adds, "Everything that we've seen or that's been developed is what the human race has just stumbled upon. We just figure stuff out-we don't come up with anything new." Concludes Barnard, "We just kind of unfold layers." The process of making the record might also be described as 'unfolding layers,' as the Shanes and their band, including drummer/producer Will Hunt (aka, electronica artist apt.core) carefully crafted these songs one by one at the duo's new headquarters and studio. Though more polished than previous releases, it still retains their indie spirit and includes fan-favorite "Yearn" and the praise chorus "None Like You." Says Everett, "We did this record a little differently. We recorded songs one at a time-drums, bass, everything-having the whole team there for the whole experience" as opposed to having a session player come in and play drums for the whole record in a day or two, followed by other players each contributing separately. "It really helped in the development of the songs," he says. "It's a great process. We'll probably never do it any other way again." That allowed for the group to get each song just right. But setting up their own studio was not without setbacks. Says Barnard, "We started a day after the drywall went up. You just have a thousand connection points-gear, console, tube this analog that, it's all wired from room to room. We had several delays that lasted for several hours because something wasn't working or wasn't connected right. We probably lost 30% of our gear from day one-we turned it all on and some of it didn't work." The trade-off was being able to record as they wanted to: "We had all of the musicians there for the whole project. Our electric guitar player, Taylor Johnson-at least half of everything he played went through a $40 amp. The month previous to the studio going up, we'd rummaged through pawn shops, thrift stores, and eBay and collected about 7 guitar amps, just junker amps, buzzing and making extra noise everywhere. We just got to explore. On Carry Away, we would use between 60 and 70 individual tracks for each song, but on Clean, we probably have 20-30 fewer tracks on each song, but it just sounds bigger-we didn't use the same guitars and same amps for all the electric parts. We got to really play around a little bit to get some amazing sounds," says Barnard. The release of Clean promises both to appeal to their college and young professional fan base and reach further into the soccer mom audience that Christian radio targets. They'll take their new songs out on the road again this October with special guest and new label-mate Mat Kearney. 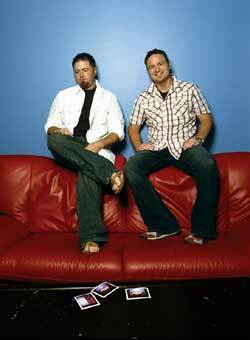 Fans can expect a blend of old and new favorites cast in a worshipful setting typical of Shane & Shane shows. "We don't sing songs because they're old or new," says Barnard. "We latch onto songs that are true, that are singable." Concludes Everett, "No matter how we feel, the truths are absolute. When I sing a wrong note, it's distracting, but it doesn't change the truth of the message. We're called to do this. We're called to proclaim the greatness of God."